’Tis the season for great meals and delicious treats! In some families, favorite dishes are handed down from generation to generation, often on stained, faded recipe cards. 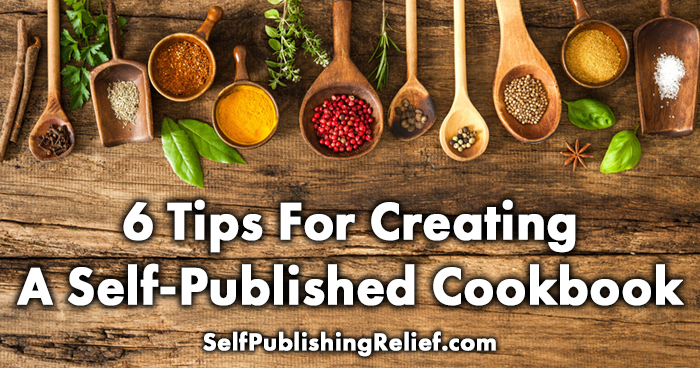 Whether you want to preserve your recipes just for your family and friends, or plan to share your culinary creations with the world, the experts at Self-Publishing Relief have smart tips for creating a self-published cookbook you’ll be proud to put your name on. Find your niche. What’s your cooking passion? Great-Grandma’s time-tested recipes? Decadent desserts? Vegetarian meals? Holiday-themed meals? Decide where you want your recipe collection to fall on the vast spectrum of cookbooks and assemble your recipes accordingly. If you’re hoping to sell lots of copies, you should also consider the market—is there a broad audience for this sort of cooking or cuisine? Here’s some promotional advice: Start a blog to build your fan base now! Have a friend double-check (test) your dishes. Once you’ve chosen the recipes you will include in your cookbook, test them on your friends and relatives. Make sure the dishes as prepared according to the instructions in your recipe are as delicious as you describe. And make sure your ingredient list and instructions are clear and appealing! Know the traditional layout for recipes. Generally speaking, a recipe includes the following elements in this order: name of dish, serving size and number of servings, ingredient list, and preparation instructions. Ingredients are usually listed in order of use, and instructions are often numbered. Check your favorite cookbooks and search online for other layout possibilities. As always with self-publishing, you have control over all the design elements and can do as you please—but we recommend staying pretty close to what cooks expect in a recipe layout. Decide if you’re going to use photos. Including images in your self-published book can have a significant effect on cost—both your cost to produce it and the price you’ll have to charge for it! But photos of dishes-in-progress and the finished product can be very helpful. Decide whether your particular cookbook really requires photos, and if so, whether black-and-white images (which will cut down significantly on the cost) will suffice. Build this into your budget. Select a type of binding. Most cooks want their cookbooks to lie flat for easier reference, but some print-on-demand platforms, such as KDP Print, offer only perfect-bound paperback books. Because perfect-bound books do not lie flat, you might want to consider other companies that offer spiral binding or other lie-flat options. Or publish your cookbook as an e-book! The decision about your binding type is particularly important for this type of book, so keep your target audience in mind! Choose cover art. No matter what kind of book you’re self-publishing, a bad cover design will ruin your last, best opportunity to close the sale. Fortunately, an image of beautiful food can be the basis of a great cover design—and if you’ve chosen not to include photos with your recipes, here’s your chance to showcase your most enticing-looking dish. While you’re creating your irresistible cookbook full of tempting recipes, be sure to cover your legal bases. Simple lists of ingredients are not covered by copyright law, but descriptions, explanations, and images that are someone else’s original work are. We are not attorneys, so if you have questions about copyright, consult the U.S. Copyright Office or a lawyer familiar with the publishing industry. Question: If you’ve self-published a cookbook, what other advice would you give?